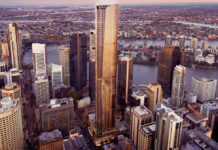 Seymour Group is planning to build a 22 level office tower in the Bowen Hills Urban Development Area. The Seymour Group has lodged an application to build a 22 level office tower on a parcel of land in Bowen Hills. 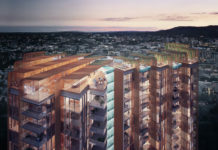 The project is known as 58-66 Abbotsford Road and is the latest urban renewal / TOD project to grace Bowen Hills. The project will have ground level retail spaces with an optional floor which is designated as ‘Shop/Indoor Sport/Office’ located above the lobby. 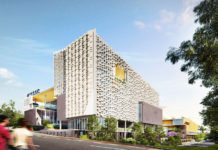 The tower will be designed to achieve a 4.5 Star NABERS Energy Rating, 5 Star GreenStar Rating and meet PCA A-Grade office standards. Given this area falls within ULDA planning control, the application has been submitted to the ULDA for approval. 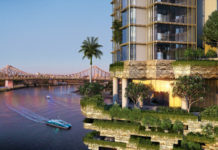 The development comes after Metro Property Group lodged DA’s to build two 24 and 30 level residential towers in Bowen Hills. Images by Nettleton Tribe Architecture.